Songs of Eretz Poetry Review: New Poem: "Snow flurries fall (after Timothy O'Keefe)"
New Poem: "Snow flurries fall (after Timothy O'Keefe)"
The latest addition to my Snowetry collection is "Snow flurries fall." I was inspired by seeing a poem prominently posted in the Title Nine women's clothing store at the Park Place shopping mall in Leawood, Kansas (I was there with my wife). I did not know at the time that I was reading a poem after Timothy O'Keefe (pictured) until I saw yet another one, this one definitely by O'Keefe, on the back of this month's The American Poetry Review. 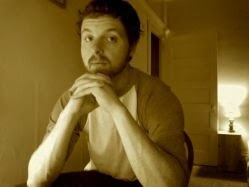 Additional information about this up-and-coming poet may be found here: http://www.pw.org/content/timothy_oampkeefe. It was both fun and challenging to compose a poem after O'Keefe's style. I persevered until I had filled an entire page side-to-side, single spaced--a full 730 words. It took several sessions over several days to complete. I ended the poem as it began, coming full circle.